Dursley invited to Party Brazilian Style! Despite the England Team’s lack lustre performance at the World Cup, the sights, sounds and colours of Brazil as the host nation certainly haven’t disappointed. As the final weekend of the tournament approaches, whether you love or hate the game itself, a fabulous Carnival Party and BBQ at the Chantry Centre in Dursley promises to be spectacular celebration of Brazilian culture. The event is being organised by community organisation World Jungle, as part of a programme of events they have run over the last few weeks themed around the World Cup, with the aim of bringing families and the wider community together. Taking place on Saturday 12 July from 7pm-11pm, the party will also be a wonderful conclusion to this year’s Dursley Festival which runs throughout the day in the town. Experience the spirit of Brazil with live Samba Drumming and Dance from Jamma de Samba (the Bath School of Samba), together with breath taking Capoeira demonstrations, disco and BBQ in the Centre’s Secret Garden. Enjoy a summer party evening amongst family and friends, at a free entry event which is open to all ages. “World Jungle has really enjoyed running this programme of family events and workshops themed around Brazilian Carnival and the World Cup. The project is with thanks to funding from the National Lottery’s Awards for All programme. Our aim has been to use the FIFA World Cup as a springboard to developing a healthier, happier, more active community; creating a wave of positive community action and making this World Cup an exciting family event – even for those who don’t like football! The Carnival Party also marks the climax of this year’s Dursley Festival which sees events running in the town centre itself from 10am-4pm, including a parade, street market, food and family entertainment. The Chantry Centre will also be open the following day screening the World Cup Final on its HD large screen in Lister Hall. We’re all set for children’s summer fun activities in the Cotswolds! Weather forecasts suggest that more great weather is on the way in the next few weeks as children across the Cotswolds look forward to a well-earned summer break. They can be assured that there will be lots of fun things to do because Cotswold District Council, in partnership with World Jungle, is offering a superb range of activities and events across the district over the entire holiday period. The 2014 ‘Summer off the Streets’ programme provides activities for children of all abilities to have fun, learn some skills and make new friends – there really is something for everyone! With a mix of Summer Workshops together with a whole host of FREE events open to all, including Community Fundays, National Playday Events, Fun in the Parks, and ‘Scratch and Skate’ Festivals – there is something for everyone to enjoy. To book and pay for activities, please go to the World Jungle website or telephone 01285 623407. The website contains all the activities covered by the Summer off the Street programme. Dance yourself fit for summer! Great news! 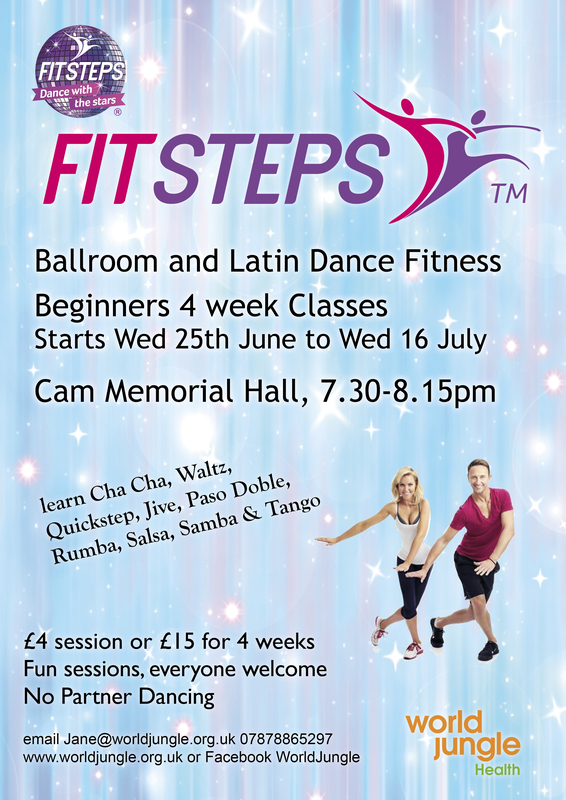 This Wednesday (25 June) Jane Manning will be starting a NEW Fitsteps Class in Cam Memorial Hall from 7.30pm-8.15pm. This is a beginners class with four weekly sessions running on Wednesdays from 25 June until Wed 16 July. FITSTEPS is an immensely fun, ballroom and latin dance inspired fitness programme. There is no partner work – just enjoy moving to the different tracks of music, learning elements of the Cha Cha, Waltz, Quickstep, Jive, Paso Doble, Rumba, Salsa, Samba and Tango. It’s a fantastic way to improve fitness, burn calories, tone up and improve posture. £4 per session (or book the 4-week block for £15). No need to book, just turn up! Please visit www.worldjungle.org.uk/health.html for more information. Jane Manning and Ben Ward from World Jungle are excited to be heading off to Turkey next week on a trip that marks the culmination of a two-year long European Project aimed at promoting learning to disadvantaged groups. The Grundtivig Learning Partnership project called ‘Beyond the Book’ brings together educators, artists, and video technicians from 9 different European countries to share their skills and explore the ways in which video production can help to support the learning of those most disadvantaged including school leavers, youth at risk, elderly and the long term unemployed. Through learning the skills of video production, the group have been shown how other key learning skills are embedded in the process and how this can be a fantastic way to engage learners who perhaps struggle with a straight classroom based experience. 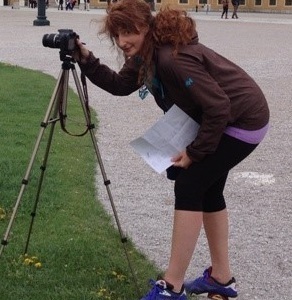 “Creating videos is a great way for people to learn a whole range of skills, especially for those who struggle with literacy and other ‘basic’ skills. Through making a video you can learn a whole range of additional skills including team building, writing, organisation and problem-solving. The approach is called ‘problem-based learning’ and it gives the learner an innovative and exciting learning experience based around ‘real-world’ needs. Once they return to Dursley, the couple are keen to start sharing what they have learned from this project with local groups across the area. Community groups and learning organisations who would be interested in finding out more about this model of learning are encouraged to get in touch with Ben on 07889 512644 or email: ben@worldjungle.org.uk Website: www.worldjungle.org.uk . It may have been rather a soggy half-term holiday, but families in Cam & Dursley got to experience some Brazilian Carnival Fun last week that chased the rain clouds away and got The Chantry Centre bouncing to the ‘Beat of Brazil’. 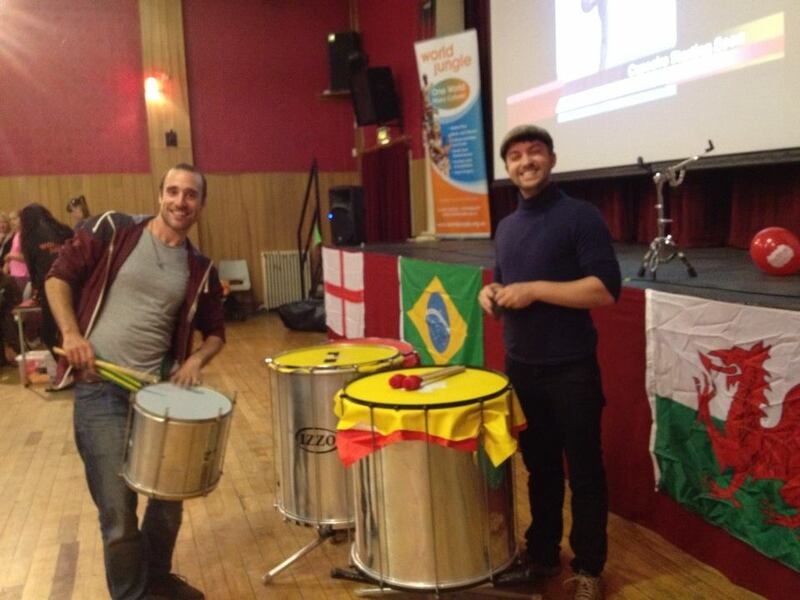 “This Fun Day was a fantastic start to our ‘All in One Rhythm’ project – a special programme of family events and workshops themed around Brazilian Carnival and the World Cup. The sun even came out for us and we were able to hold the Samba Drumming Workshop outside in the centre’s ‘Secret Garden’. The next ‘All in one Rhythm’ Family Fun Day is planned for Saturday 14 June from 1pm-4pm. Again, there will be lots of free activities on offer for the whole family to enjoy, bringing the colour and energy of Brazil to the heart of rural Gloucestershire. All the events will take place at The Chantry Centre (Lister Hall) in Long Street, Dursley. Put these dates in diary now! Tuesday 24th June (5-8pm) – FAMILY FUN EVENING with the England Game showing on the big screen.